Fine as its set-pieces are, the chief joy oí the Book of Kclls are the illuminated initial letters which are scattered with generous abandon through every page of text. 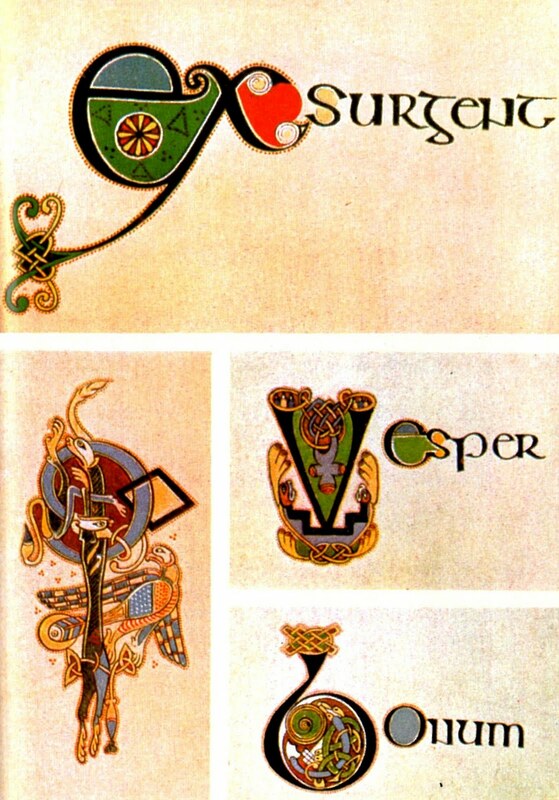 These letters distinguish the Book of Kells most from all other manuscripts in the Insular tradition. Though these are usually to be found on the left of the page, they are not always so. It is also far from uncommon to find even small letters in the middle of a line embellished with an extra twirl, or with their open áreas filled with contrasting colours, or the inconvenient space at the end of a sentence filled with stars, or fish or birds. The examples on this page and the next are in fact taken from copies made with an accuracy and beauty unsurpassed even by the origináis. On this page are shown three examples of black-letter initials (EXSURGENT, VESPER and BONUM) where the initial letter is written in ink and differs little from the rest of the text, except in size, and coloured adorn-ment, and where subsequent letters diminish gradually in size until they merge gracefully into the rest of the text. 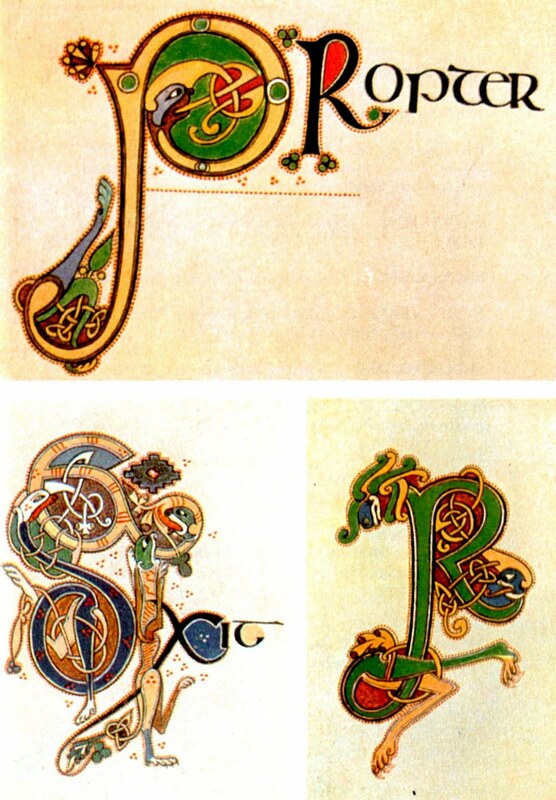 The “P”of PROPTER and the letter ‘K’ in this plate are samples of the other great t radition of Celtic initial illuminating. In this, the basic form of the letter is retained, but drawn as a coloured ribbon with its extremities adorned with heads and limbs which bear no real relation to the letter but provide a harmonious extensión of it. Note that the border of the ribbon is never a single line but is always embellished in some manner, usually as here by a fringe of red dots. Less commonly are the first T of ET DIXIT in this píate and the T’ of PO[nite] in Píate XXIII where Ihe letter or part of it is actually formed by a recognizably complete animal forced into an unnatural posture by the demands of the letter. This is much more a continental tradition. Its use in an Insular manuscript such as the Book of Kdls is another pointer towards the relative lateness of the work, just as the extensive use of mongrams, as in ET DIXIT, confirms its essentially Insular charac-ter. It is precisely this blending of so many distinct strands that gives the Book of Kclls its unique charm. As posted on Love of the Goddess, all rights reserved by the author. Lammas, also known as Lughnasadh, is the first of the three harvest festivals of the year. It is the time of great bounty when people would start preparing their stock for the coming winter. Being a festival to honor grain and the harvest, it was traditional to bake bread on Lammas. People would only harvest their grain on the day of Lammas and not a day before. This was because if the crops were left in the fields for too long, or the bread not baked in time, the people could starve. On Lammas, we honor many different Goddesses , such as Ker the grain Goddess, Madron the mother Goddess, and Demeter Goddess of the harvest. Ker was prayed to while ancient women would bake bread on the day of Lammas. Since she is a grain Goddess, they would ask for her to bless their grain so that it would last through the coming months of winter. Madron is the bountiful mother Goddess who gives birth to all the crops. It is said that Madron was worshiped by Neolithic peoples in the British Isles. They would honor her by building sacred mounds on the earth, these were said to represent the womb of the pregnant mother Goddess. This is the time of the killing of the Corn King-John Barleycorn. This festival is Lughnasadh in honor of the God Lugh. 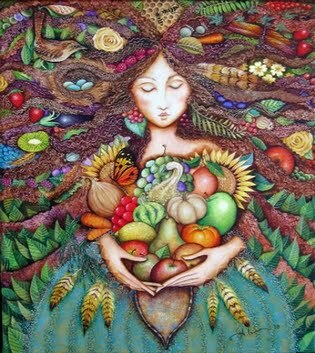 Lughnasadh celebrates the harvesting of crops. The sickle and the scythe are symbolically used at this time represent the Goddess because they are in the shape of the Lunar crescent. The pitch fork represents the Horned Lord. The combination of the pitchfork and the sickle/scythe bring about the harvest. At this time the energies of the Earth begin to decline. Growth ebbs to completion; life loosens its passionate hold and prepares to yield up its fruits. The Goddess begins to show signs of weariness from the planting and growing season. The Earth Mother is beginning the process of letting go, moving unavoidably toward darkness and Winter. Corn and grains are of particular significance at this holiday. Traditionally, the newly harvested grain is made into loaves of bread and shared with all in celebration. It is traditional to fashion a corn dollie from the last stalks of grain to be harvested. It was believed that these stalks contained the ‘Spirit of the Corn’. The bundle of grain is formed in the shape of a woman, the Harvest or Corn Mother. Traditionally, the corn dollie was hung first in the barn to preside over the threshing of the grain, and then in the farmhouse until the planting of the new grain in Spring. Today, the dollie is placed on the altar for the Mabon celebration and then hung in the house or on the front door until Imbolc when it is burned to release the “Spirit of the Corn” to bring life and growth once more. Lughnasadh is a holiday sacred to the Irish God Lugh. Lugh is associated with the power of sun and light, and so fires were burned in honor of him on this day. In addition to his associations with light, Lugh is a God of Skill and Craft, a master of all human skills. On this his feast day, it is particularly appropriate that we celebrate our own abilities, skills and accomplishments. Whatever our talents or abilities, this is a time to recognize them and honor them, and to share our recognition of the talents and abilities of others around us. By offering the fruits of our labors back to the Universe we enrich both ourselves and our world. After the harvest, tribes would begin to prepare for fall by storing vegetables and canning. Saving and storing your vegetable harvests was the only way to sustain your family through the long, harsh winter. Use the wonderful harvest energy to gather your magical and culinary herbs and empower them as part of your winter stores. Love of the Land, the Earth, the Wild ~ reverence for Nature. Love of Peace ~ Druids were traditionally peace-makers, and still are: each ceremony begins with Peace to the Quarters, there is a Druid’s Peace Prayer, and Druids plant Peace Groves. Love of Beauty ~ The Druid path cultivates the Bard, the Artist Within, and fosters creativity. Love of Justice ~ Druids were judges and law-makers. Traditionally Druids are interested in restorative, not punitive, justice. Love of Story and Myth ~ Druidry recognises and uses the power of mythology and stories. Love of History and Reverence for the Ancestors ~ Druidry recognizes the forming power of the Past. Love of Trees ~ Druids today plant trees and Sacred Groves, and study treelore. Love of Stones ~ Druids today build stone circles, collect stones and work with crystals. Love of Truth ~ Druid Philosophy is a quest for Wisdom. Love of Animals ~ Druidry sees animals as sacred, and teaches sacred animal lore. Love of the Body ~ Druidry sees the body and sexuality as sacred. Love of the Sun, Moon, Stars, and Sky ~ Druid Starlore, embodied in the old stories and in the stone circles, teaches a love for the Universe. Love of Each Other ~ Druidry fosters the magic of relationships, of community. Love of Life ~ Druidry encourages celebration and full commitment to life ~ it is not a spirituality that wants us to escape from life. The lineage of the Druid spiritual tradition can be traced across many thousands of years of time, as posted by Philip Carr-Gomm , founder of The Order of Bards Ovates and Druids. all rights reserved by the author. We see the first evidence of spiritual practice in Europe 25,000 years ago – when candidates for initiation would crawl into caves, such as those at Lascaux in France or Altamira in Spain, which are dramatically painted with figures of wild animals. After being initiated in the belly of Mother Earth, they were reborn into the light of day. Twenty thousand years later, in around 3000 BC, we can see the same practice of seeking rebirth within the Earth: great mounds were built, in which initiates would sit in darkness awaiting the time of their rebirth. The best example of this is found at New Grange in Ireland, where a shaft is oriented to the Winter Solstice sunrise, so that the dawn rays can bathe the initiate in sunlight after his or her vigil through the night. Four and a half thousand years later, in the sixteenth century, the key text of Druid spirituality, transcribed from the oral tradition by Christian clerics, talks of the spiritual and magical training of a Druid, in which he is eaten by a Goddess, enters her belly, and is reborn as the greatest poet in the land. So from over twenty thousand years ago to the sixteenth century, we see a common theme – which we find again in the training of Druids and poets in Scotland up until the seventeenth century. There, to awaken their creative genius, they were told to lie in darkness for days, and after this period of sensory deprivation, they were released into the brightness of the world. This theme of seeking spiritual rebirth and creative expression through undergoing a simulated death-rebirth experience, runs like a golden thread of spiritual practice through the four major periods of history that relate to Celtic and Druid spirituality: The first is the prehistoric period: in which as the Ice Age retreats from Europe, tribes from many directions, including Spain and the steppes of Russia, move westwards towards Britain and Ireland. A megalith building culture develops, which raises great mounds like New Grange, and great circles of stone, like Stonehenge. They possess considerable knowledge of astronomy, have engineeering skills that we find hard to understand even today, and use Pythagorean mathematics to build their monuments, two thousand years before Pythagoras is born. This period of pre- and then early Celticism gives way to the period of documented history, in which we can read about the Celts and Druids from the works of classical writers, such as Julius Caesar. We discover that the Celts had developed a highly sophisticated religious system, with three types of Druids: the Bards, who knew the songs and stories of the tribe, the Ovates, who were the healers and seers, and the Druids who were the philosophers, judges and teachers. During this time there was much cross-fertilisation between Celtic culture and that of Greece and Rome. With the coming of Christianity, we enter the third period: in which the schools of the Bards became Christian schools, and continued to exist until the seventeenth century; and in which the Ovates became the village healers and midwifes; while the Druids remained as the intellectual elite, and mostly converted to Christianity. This period lasted for a thousand years: from the triumph of Christianity over all of Europe by the sixth century, to the sixteenth century. During this millennium, Celtic and Druid spirituality was preserved by the Christian clerics who performed the valuable service of recording many of the stories and myths by which the oral teachings of the Druids were conveyed. People who think that Druidry was destroyed with the coming of Christianity fail to understand the resilience of spiritual teachings when they are encoded in myths and stories: and it is thanks to the clerics’ recording of these tales that we are able to be inspired by them today. St Patrick also recorded all of the old Druid laws in Ireland – providing us with invaluable information on the ethics and social structure of pre-Christian Celtic culture. Celtic heritage. The Church had taught that we were savages until the arrival of Christianity. But with the translation and printing of the classical texts on the Druids, Europeans discovered that their ancestors were far from being savages. At the same time, reports were coming back from America of Native American people who, like their ancestors, had been untouched by Christianity, and yet were worthy of admiration. 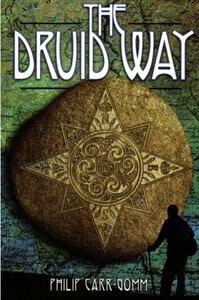 This provoked a period known as The Druid Revival in which groups and societies were formed to study Druidry and Celticism. The founding father of the science of archaeology, William Stukeley, formed a Druid society in London and appointed the Princess of Wales as its Patroness. Cultural festivals, incorporating Druid ceremonies, and celebrating Celtic languages, grew up in Wales, Cornwall and Brittany. And this period of Revival has never finished. Instead, it has developed into a Renaissance, as more and more people find within Druidry a living spirituality that holds all of Nature sacred, and that offers a path of creativity and freedom, rooted deep in ancient tradition.